Buffalo HD-WL4TU3R1-EB DAS kopen? | That's IT! Deze DAS (Direct Attached Storage) oplossing is gebruikt, professioneel getest en verkeert in keurige technische en optische staat. Deze DAS beschikt over een USB3.0 interface, waarmee hij bijvoorbeeld prima via uw router op uw netwerk kan worden aangesloten (deze route moet dan uiteraard ook over een USB3.0 interface beschikken). Wordt compleet met alle accessoires geleverd. In de geleverde uitvoering voorzien van 2x 2TB harddisks voor een totale capaciteit van 4TB. De daadwerkelijk beschikbare capaciteit is uiteraard afhankelijk van de gekozen RAID-modus. 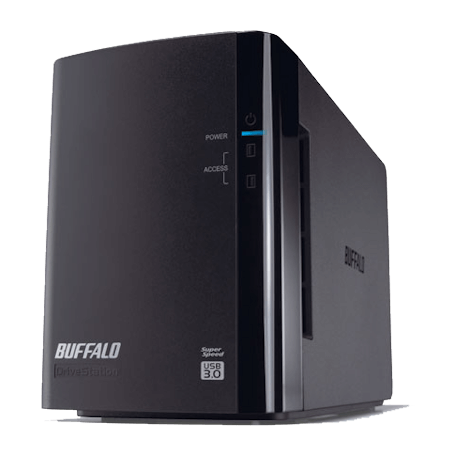 Enjoy speedier backups with the Buffalo DriveStation™ Duo USB 3.0 (HD-WLU3) – a high performance, multimedia, external hard drive with data transfer speeds of up to 10 times faster than standard USB 2.0 portable hard drives. The two-drive, two-bay unit is enabled RAID 0 for maximum performance or RAID 1 for maximum redundant storage. 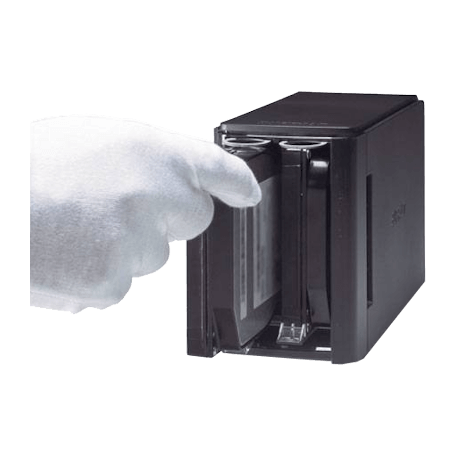 It quickly provides additional storage to backup all your multimedia files. 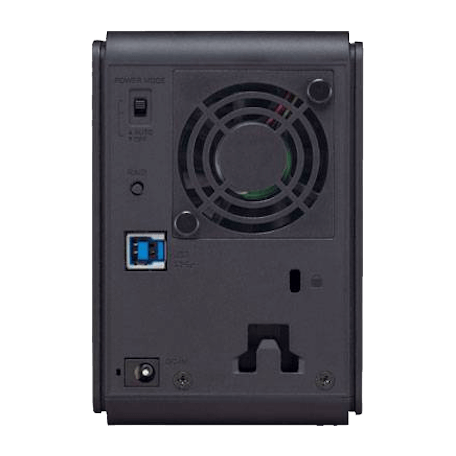 DriveStation™ Duo USB 3.0 is the perfect choice for a small office that requires large amounts of storage space. 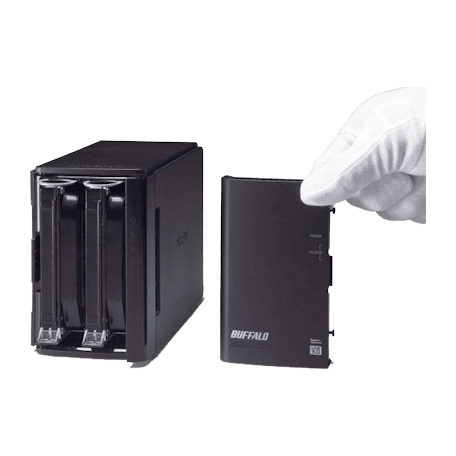 Equipped with USB interface speeds of up to 5 Gbps (with USB 3.0) and backup software from NovaBACKUP® Business Essentials, the DriveStation™ Duo 3.0 is primed to backup your database or entire server system quickly. 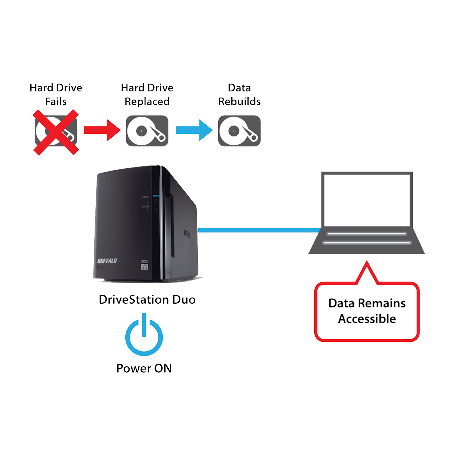 The DriveStation™ Duo USB 3.0 comes complete with the Buffalo Tools suite of complimentary software offering enhancements such as TurboPC and TurboCopy to improve the drives’ file transfer speed and copy performance.